This year’s Honolulu Surf Film Festival is marked by a hard-to-miss botanical illustration. Set against a black and purple background, large retro hand-rendered letters get viewers stoked for the July festival. Considering past SFF logo illustrations, this year’s design, with its dark color palette, is a tad unusual. The man behind the bold illustration? Jeff Gress. In 2011, the East Bay, California native graduated from the University of Hawai’i at Mānoa with a BFA in graphic design. That was also the same year as the first POW! WOW!, a street art festival that started in Hawai’i but now spans streets and walls around the world. At the time, Gress was interested typography but tired of only working behind a computer. He was ready to get into more “hand-created stuff.” So when his professor brought his class to a POW! WOW! event, he was enthralled by the work they were doing and those larger scale paintings. “As I was figuring out what I wanted to do professionally for a career, I started helping with them and volunteering,” he says. He began doing their operations and soon after in 2012, he was named POW! WOW! Hawai’i’s operations director. 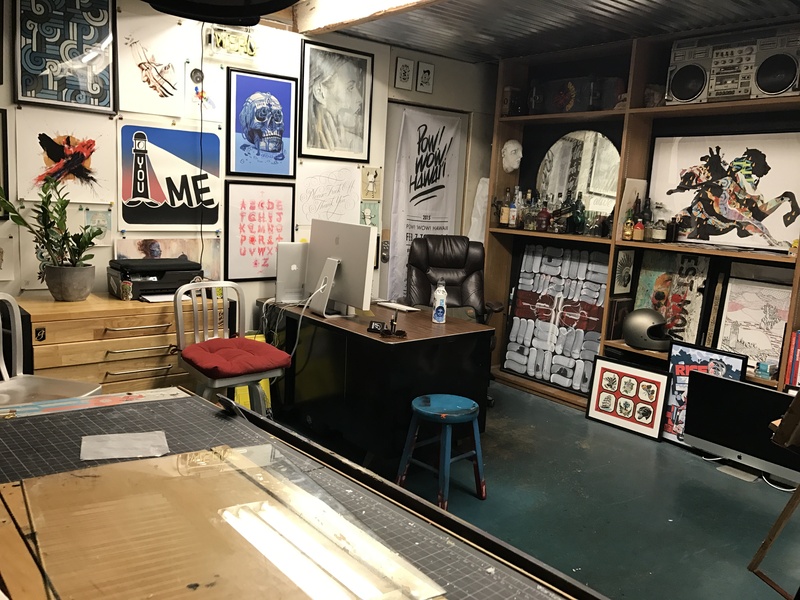 Around the same time, Gress spearheaded the opening of Lana Lane Studios, a community space where over 30 working artists of all mediums are able to freely let their creative juices flow. When he’s not working with Lana Lane Studios, he continues to hone in on his craft, painting murals and other artworks around the globe while focusing on brush script calligraphy. One collaborative mural inspired by the Junot Diaz book The Wondrous Life of Oscar Wao caught the eye of our senior graphic designer Anjali Lee. In tandem with fellow POW! WOW! 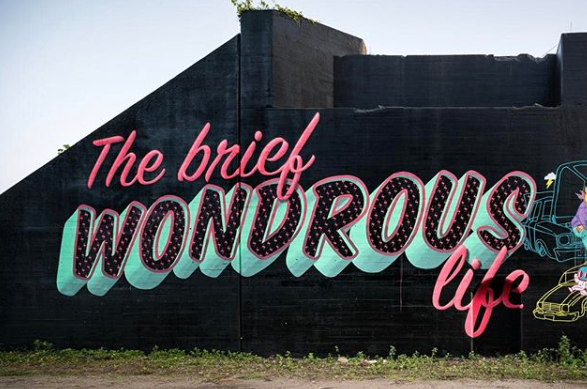 Co-founder Jasper Wong, Gress painted the mural in 2016 alongside the Cleveland railway for the Anisfield-Wolf Book Awards. Lee fell in love with the mural’s color palette and proposed him to the museum as this year’s freelance illustrator—as they say, the rest is history. The collaborative mural that first intrigued Lee. 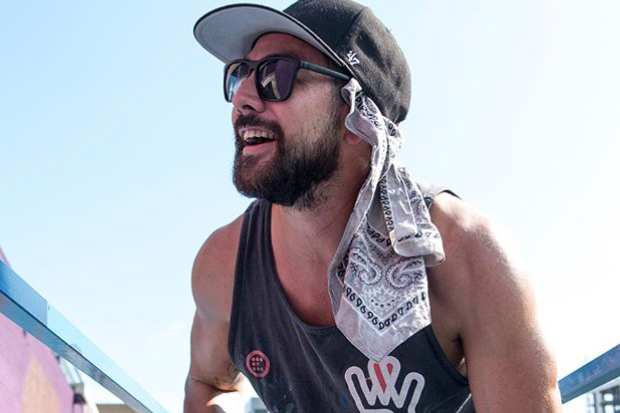 To learn more about what went into creating this year’s logo, we caught up with Gress on the phone while he was running around Long Beach, California for a POW! WOW! Long Beach event. I would say inspired by hand-rendered type from classic sign-painting techniques. Being from a graphic design background, I really recognize the value of legibility in graphic design and readability, so it was a combination of trying to create something that’s got some readability in the letters but also, you know, have that personal touch to it so that it doesn’t necessarily read as a font that you would kind of pick out or something like that. 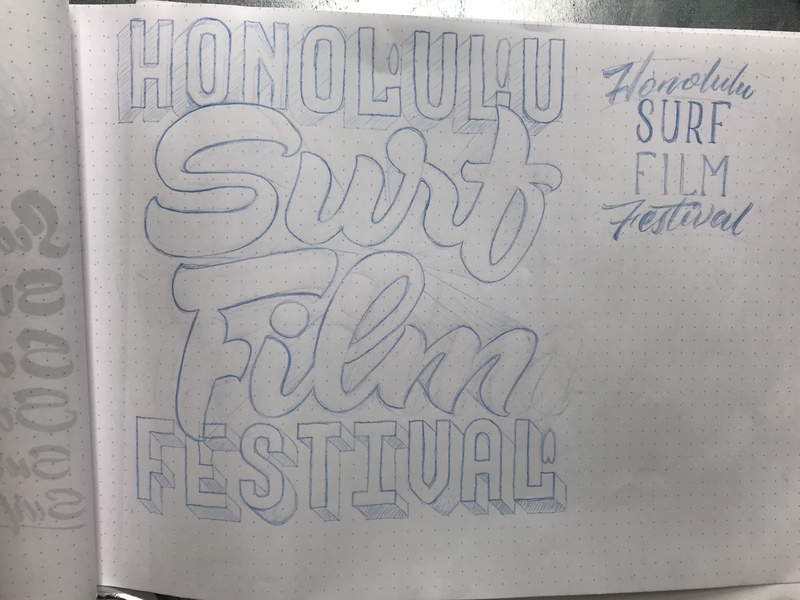 How did it feel to learn you were going to create the Honolulu Surf Film Festival illustration? I was really stoked. I hadn’t worked directly with the museum before, and I know we did work with them with POW! WOW!, so it was really nice to do something. You know, I’ve gone to a lot of the films and went to a couple different surf films at the Doris Duke Theatre so it was cool to contribute to that. 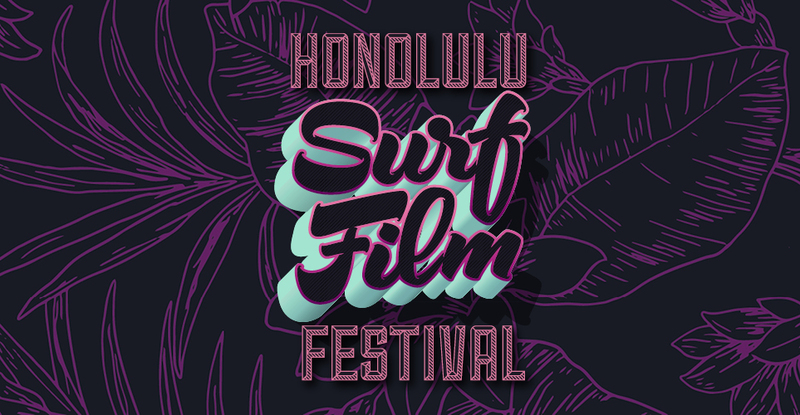 And I surf, I surf in Honolulu so I thought it was nice to be able to actually identify with what it is and then to be able to participate in this cool project, which is the surf film festival. How long did it take for the illustration to be finished from inception? I think I had the original sketches within the first week, within the first few days. And that actually was easy to develop and so I think once that sketch was approved, I got the design done within a couple of weeks. Probably took a good eight days of really rendering the digital sketch. What were some of the challenges to creating the illustration? I think the hardest part would be to try and not over-design the image but to give subtle details that are apparent to discerning viewers. What do you want viewers to feel when they see the illustration? I guess I really wanted these subtle waves as the brush points. Basically all the points and all the curls were little waves in my head, so I wanted to be able to really subtly create a brush script that I do normally but have it be a very minimal nod to surf culture. I kind of had the feel of wetsuits and the ocean, those kinds of colors, and I just wanted to relay that—just a subtle minimal sense of surf vibe. Meet Gress in-person and bring home a little bit of his talent with you at July’s ARTafterDARK: Board Room, taking place on 7/27. He’ll be stationed in the Museum Shop to do live sketching on glass jars that will be available for purchase.